Positioned high above the River Trent, just to the north-east of East Bridgford, the church is recorded in Domesday as a moiety (half a church) in the lands of Count Alan; there was also a priest. 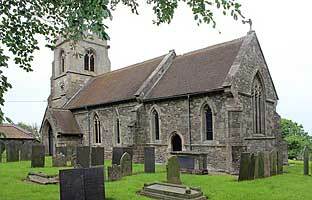 In 1235 a third part of the church was owned by the canons of Newbo Abbey in Lincolnshire, and it is likely that another third was held by Welbeck Abbey. For much of the 17th century the church was, in various ways, out of repair, and it seems unlikely that things improved over the next two hundred years. In 1879 the church was largely rebuilt to plans by Ewan Christian, architect to the Ecclesiastical Commissioners. This work involved the entire chancel and parts of the nave side walls; a new south porch was added at the same time. The building comprises a nave with south porch, chancel with north vestry, and a west tower. The tower is of the 15th century and, although restored, retains much medieval fabric. The lower part of the north and much of the south walls of the nave are also medieval, of indeterminate date but probably 15th century; there are traces of a possible former aisle arcade in the south wall. The remainder of the building dates from 1879. The medieval font, probably of the 13th century, and a poor-box formed out of a 15th century roof timber, are the only substantial pre-Victorian fittings remaining. There are some 18th century monuments to the Story family. Pre-Reformation wills show that the church was dedicated to Saints Peter and Paul. Ecton’s Thesaurus (1763) gave the dedication as St Peter, but by 1880 and subsequently it is known to have been dedicated to St Helen. Particular thanks to Sarah Maguire, John Beckett, Chris Brooke, Dr Steve Parry and Dr Graham Lott for research on this entry and to Chris Brooke and John Beckett for the photographs.